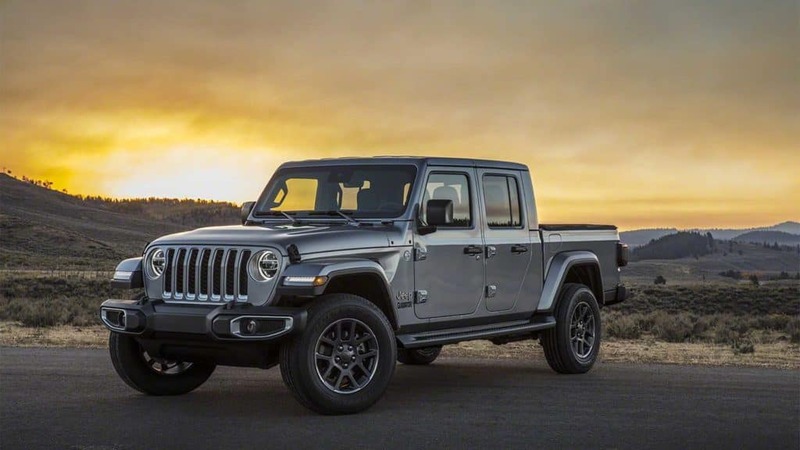 It’s official, the all-new 2020 Jeep® Gladiator, touted as “the most capable midsize truck ever,” was finally unveiled after a wide array of spy photos and accidental leaks that flooded the internet for months. We’ve been hearing rumors about a new pickup from Jeep for over ten years now – dating back to the 2005 Gladiator concept that never came to fruition. Now that we’ve got confirmed specs let’s check out just how much this pickup adopts from the latest generation Wrangler versus what’s exclusive to the model. The brand’s excitement over their latest vehicle is palpable, with Tim Kuniskis, head of the Jeep brand, claiming that the Gladiator is “the ultimate vehicle for any outdoor adventure.” One look at this capable monster is enough to get everyone to agree with Kuniskis’ words. Riding on a traditional body-on-frame chassis, the Gladiator sports high-strength aluminum doors, hinges, hood, fenders, windshield frame, and tailgate. Four different trims – Sport, Sport S, Overland, and Rubicon – will be available, and depending on the selected model there will be three different roof options available – a body-colored hardtop, a standard hardtop, and a soft top option that features a manual rear-sliding window. Higher-tier trims like the Overland and Rubicon will come standard with LED headlights, fog lamps, and daytime running lamps. A wide tailgate provides lockable access to the Gladiator’s five-foot steel bed and is capable of locking in three different positions. The tailgate also homes an external three-prong, 115-volt source, and under-rail lighting for better visibility. Behind the rear axle and under the truck bed, consumers will be able to find a full-size spare wheel mount that can hold up to a 35-inch tire. On the inside, a storage trundle sits below the rear bench that’s capable of folding flat to provide additional storage space. With the rear bench folded, LED lights found on the quarter trim panels light up the storage space behind the seats. Drivers will have a 3.5-inch instrument cluster and a standard 7-inch touchscreen display loaded with the Uconnect infotainment system. An optional 8.4-inch touchscreen with navigation and the latest generation Uconnect infotainment system is also available. Under the hood, the Gladiator is powered by a 3.6-Liter V6 Pentastar engine that’s been refreshed to increase fuel efficiency by six percent. This Pentastar generates 285 horsepower and 260 lb-ft of torque, all while mated to a six-speed manual transmission or an optionally available eight-speed automatic. The brand also plans to introduce another engine option in 2020 – a 3.0-liter six-cylinder diesel engine (will be mated to the eight-speed automatic transmission only) capable of generating 260 horsepower and a whopping 442 lb-ft of torque. As is customary, different trims offer different added features, and the new Gladiator has over 80 active and passive advanced safety systems. Blind-spot monitoring, rear cross path detection, a standard rear parking camera, adaptive cruise control, and electronic stability control (ESC) with electronic roll mitigation are among some of the more coveted advanced safety features. An innovative forward-facing off-road camera is exclusive to the Rubicon trim and allows drivers to see obstructions on the trail easily.